Perhaps one of the most popular annual events to hit the LA Convention Center is the Los Angeles Auto Show. The LA automobile show provides the perfect opportunity for consumers to learn about all the latest advancements in technologies and more. This year, the LA Auto Show will take place from December 1st through the 10th. Get your tickets for this exciting event today and don’t forget to book your boutique hotel DTLA is the perfect place for that! If you love everything cars, then the Los Angeles Auto Show is just the event for you. The annual event is the perfect place to learn and explore different vehicles. There will be a whole area dedicated to customized cars as well as exotic sports cars. 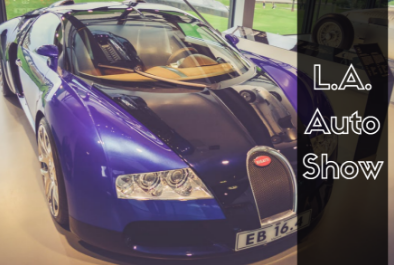 If you are in the mood for a new car, the LA Auto Show is also a great way to test drive some different vehicles in one place and to experience hassle-free car shopping. Some of the automakers that will be in attendance at the 2017 auto show include Acura, Audi, BMW, Dodge, Fiat, Genesis, Infiniti, Jaguar, Jeep, Land Rover, Lexus, Maserati, Mercedes-Benz, Porsche, Tesla, Volkswagen, Volvo and many more. Collectively, there will be 1,000 of the newest vehicles from these automakers. Also at the Los Angeles Auto Show will be fun prizes and raffles to partake in! Some of the contest prizes include an Oxbox One + Forza Bundle, LA Original Edition URB-E Pro GT, Speed Ventures Track Days and more. There are some different ticket options for you to enjoy so that visiting the car show works with your schedule. Consider the “Any Day” ticket option which is good for entry for any one day of your choice from December 1st through the 10th. Adult tickets are $15, seniors $10, and children 6-12 $5. Children under the age of 6 get in for free. Visit the official website and get your tickets today.